One of the most inspiring documentaries I’ve seen in the past year was “Ray & Charles Eames: The Architect and the Painter” (http://tiny.cc/alqtyw). What most inspired me about it—besides the incredible work this prolific couple created—was the environment in which they created it. When we grow up at OKRP, we want to be Ray and Charles Eames, and we want to work in their space. An open, bright warehouse in post-war Venice, California, the Eames’ studio was the original rehabbed loft. Although it was an open environment, it was full of enough nooks and crannies for designers, artists, architects and filmmakers to get completely lost in their art. It was pre-hippie California, but there something incredibly free-spirited about the space and the way the Eames’ and their team worked the floor. The famous Eames Lounge Chair, the film “Powers of Ten”, typefaces, sculptures, modern homes were all born in this simultaneously cozy and combustive environment. That’s the thing about workspace. When it’s right—when the room is open enough to roam, but quiet enough to think, when the morning sun hits just the right way through the windows and the afternoon sun sets in just the right position over the skylight, and when it’s raining and you can hear the slick roar of cars on the street below—when all of this is clicking, you just know the work that comes out is going to be at least one half grade better than it would coming out of an office building. B’s are B+’s, and B+’s are A’s. The space we temporarily occupy in Chicago’s West Loop has some of this going on. It’s called a “work and wellness” space, which is really modern way of saying a there’s lot of little companies coexisting under one roof. And while our agency takes a majority of the space, we are surrounded by creative start-ups who inspire us every day. There’s a social media company next door, a company that offers one hour classrooms in everything from Swing Dancing to Scotch Making, a digital poster printer, t-shirt entrepreneurs and a few app designers sprinkled in for good measure. And when this place is really going, all of these separate companies are busy running around doing their separate thing, but hum like we’re all working together. It’s how I imagine things at the Eames Studio being in 1952, and it’s definitely a vibe we want to continue to capture and promote when we move to a more permanent space soon. We aim to create an environment that will welcome other creative talents and teams to come in and be part of the scene—whether they are working directly with us, or not. More on that to come, and more real estate updates later, as well. 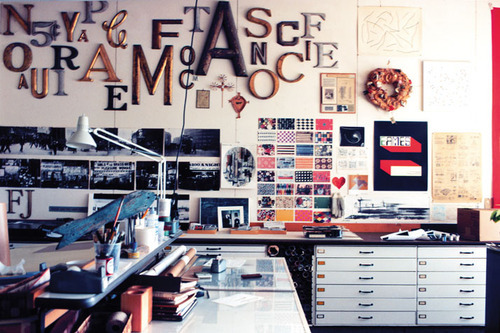 In the meantime, if you have 45 minutes, check out the Eames doc.